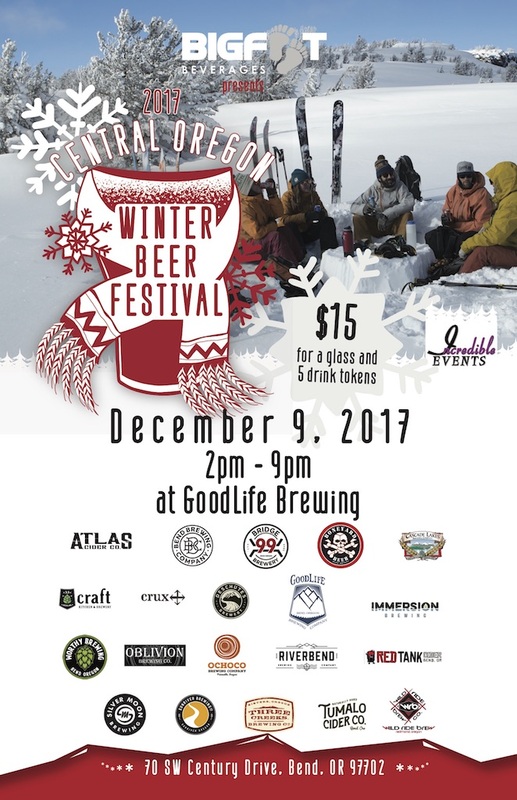 GoodLife Brewing Company is hosting the 5th Annual Central Oregon Winter Beer Festival presented by Bigfoot Beverages in the Century Center Courtyard on Saturday, December 9th, 2017 from 2pm-9pm. COWBF is a showcase for seasonal and specialty beers brewed in celebration of the holiday season. Admission to COWBF will be $15.00 and attendees will receive a commemorative COWBF glass, as well as 5 drink tickets. Each additional ticket will cost $1.00. The festival will be in a heated tent, and there will be food carts available on-site! Soon after opening we began selling beer in all of Oregon, Washington and Idaho. We are now as well opening limited distribution in Vermont and Hawaii. Proving to be quite successful, we were the first brewery in Bend, OR to can beer. Our Sweet As! Pacific Ale was voted the best canned pale ale in America 2013 and the best beach beer 2013. We continue to grow and produce more offering in cans. As brewers of hand crafted ales, we are outdoor enthusiasts who look forward to sharing our craft beer that is balanced and highest quality.